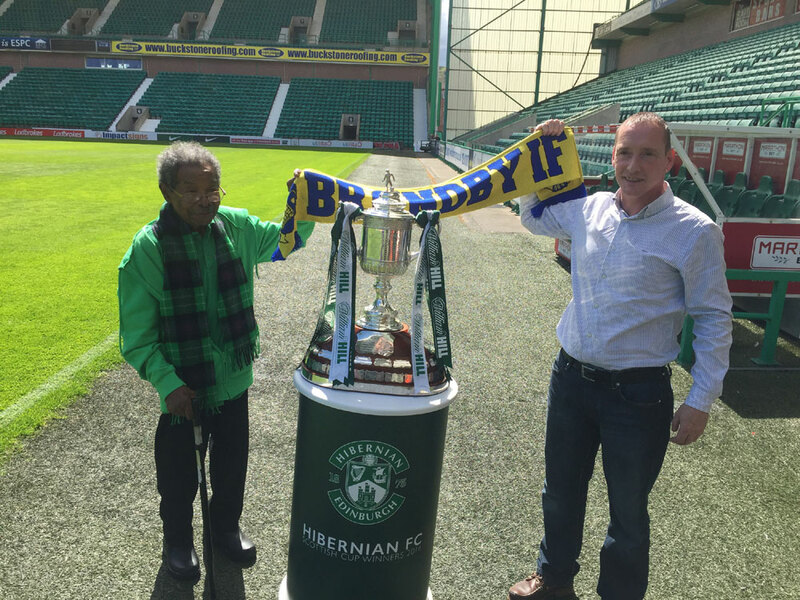 A HIBS fan aged 106 has finally got his hands on the Scottish Cup – 70 years after first watching his team play. 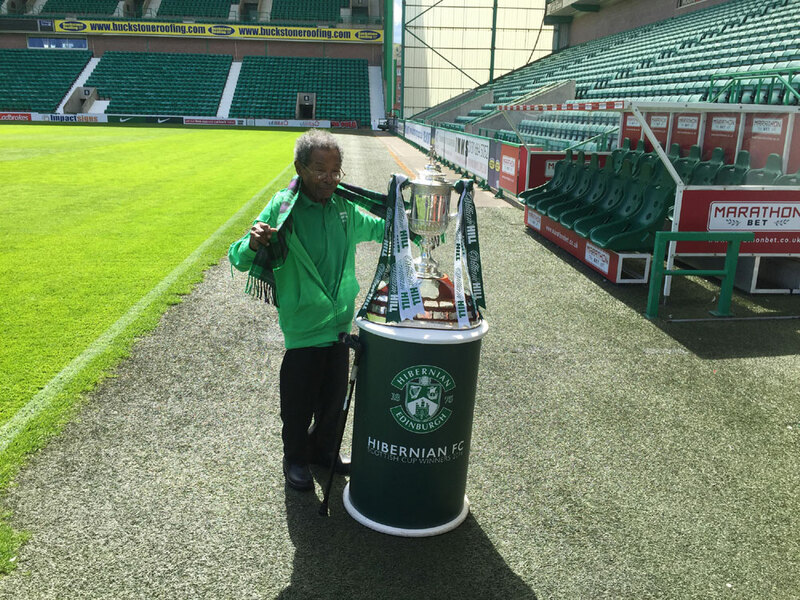 Sam Martinez visited the Edinburgh club’s Easter Road stadium on Thursday afternoon to get his hands on the cup after decades of cup final turmoil. Dressed in a Hibs green jacket and scarf, Mr Martinez even planted a kiss on the famous old trophy which had eluded his team for the previous 70 years he’s been a fan. After arriving in Scotland from Belize, he attended his first match back 1945 but had to endure years of cup heartache before Hibs finally ended their 114-year cup final hoodoo in May this year. Like thousands of other delirious Hibs fans, he saw the men from Leith defeat Rangers in one of the most thrilling cup finals of recent years. He watched the Hibees win at Hampden after his carer, James Lawrie, managed to bag free tickets from club bosses for them to go to Glasgow. And yesterday, Mr Lawrie arranged for Mr Martinez to go and see the trophy at the home of his beloved side. The 45-year-old said: “It was amazing. We were on the pitchside with the cup, and we got to hug and kiss it. It was such a great day. “He showed us where his first seat was, when he first came to Easter Road. It was behind the dugout. He remembers everything. He’s such a special guy – it’s a pleasure to look after him. “When we won the cup, everybody was just cuddling him and kissing him. I cried my eyes out for days. When the final whistle went, and we won, I just cried and cried. The centenarian fell in love with Hibs back in 1945 after being handed a free ticket by a kind-hearted fan outside the stadium and realising they played in his favourite colours – green and white. Despite watching them lose in the previous six finals he attended, he never lost hope that one day he’d see them become Scottish Cup champions. Speaking ahead of the final, he said: “Green and white were my favourite colours and that’s what Hibs played in so I’ve supported them ever since. “I watched the famous five and even them, they just couldn’t win the cup. A Hibs spokesman said: “We were delighted to give Sam the opportunity to see the Scottish Cup in person after such a long time supporting the Club. “The victory has brought a lot of happiness to all our supporters, and they all love getting their hands on the trophy. Hibs defeated Rangers 3-2 on May 21 this year thanks to an injury-time winner from captain David Gray. The cup final was marred by ugly scenes following the final whistle as the crowd flooded onto the pitch and rival fans clashed.